If there’s one thing I can count on this world, it’s that the Target near my house will always have the latest, greatest, limited edition Oreos. Unlike those who’ve had to travel all over the city in search of them, I found the Candy Corn Oreos while picking up a prescription. They were front and center at multiple registers, in the Halloween aisle, and in (of course) the cookie aisle. At one point, I felt I couldn’t turn a corner without running into them. 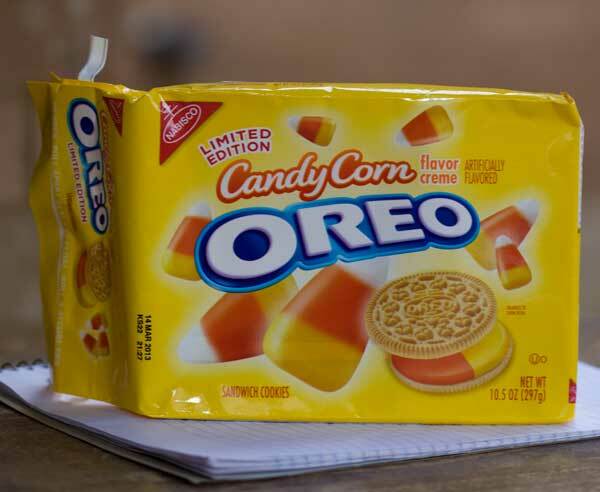 Was I on the tail end of the Candy Corn Oreo crazy or had it just begun? Did it even matter? Having read other reviews, I had an idea of how they’d taste. 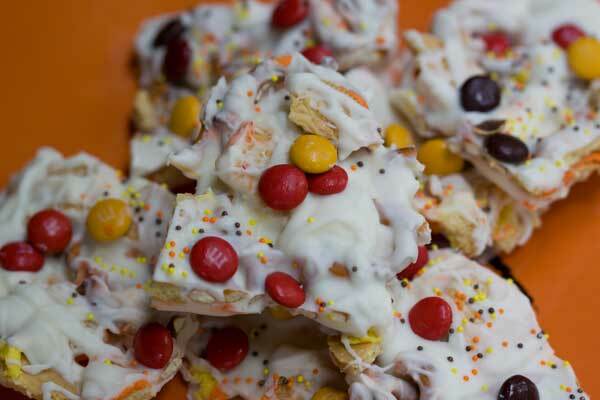 And somewhere between Target and my house, I came up with a good way to use them – Halloween Cookie Bark. Okay, so how did they taste? Well, like something that should go in Halloween cookie bark. They weren’t bad, nor were they great. They were somewhere between okay and good, but too pretty to ignore. As expected, they were right at home in the mixture of white chocolate coating, pretzels, peanuts and M&Ms. You could use Golden Oreos in their place, but these are so much more fun, so if you see them, pick them up and tell me what you think. In a microwave-safe bowl, melt the white chocolate as directed on the package. Alternatively, you can melt it in a candy melter or over a double boiler. Meanwhile, break the pretzels and cookies into large chunks (I left my pretzels whole, which is an option). Stir the pretzels, cookies and peanuts into the melted white coating, and carefully spread into a slab on your lined tray. Sprinkle M&Ms over the top. Decorate with sprinkles. If you don't like sprinkles, just use a few anyway. Let the candy sit until coating solidifies or put the whole tray in the refrigerator to solidify. Consider all the amounts given suggestions and use as many add-ins as you want. Hooray! Glad you found them. I’m starting to see them around here, too. About the blondies, vanilla would be fine. Curious to see if you would recommend the almond extract with these or sub vanilla? those look awesome, I thought about it, but I’m thining white chocolate candy corn M&Ms would just put them over the top. The evil empire has struck with a new flavour 🙂 and you have taken it over the top!! I was thinking of getting these and using them in brownies and then decorating the brownies on top with candy corn to send in the “kids” Halloween care packages…these packages started when the oldest kid was around 5…the youngest is now a sophomore in college but the packages live on for all of them:-). Thoughts on that use? Oh, is that what I was tasting? I knew it tasted familiar but I also new it wasn’t the golden oreo taste or the candy corn taste. The bark is what I had in mind, too. But between me and the kids, we just ate them straight. 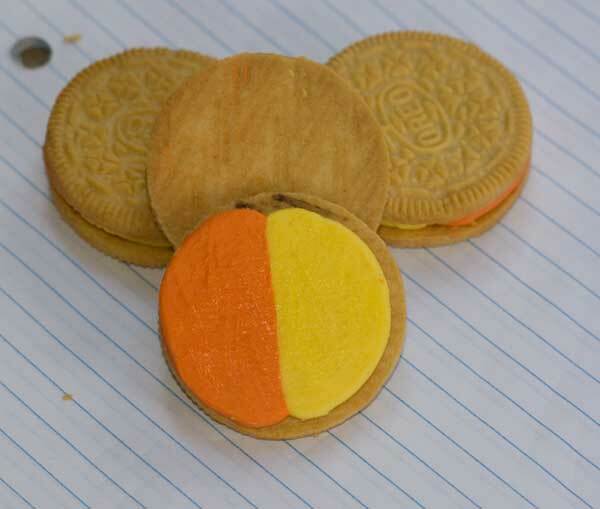 I think they’d be even better if they had included a little white so they look more like candy corn inside… the visual is pretty much the main thing these cookies have going for them, so why not go all out with the candy corn colors. Ah, thanks. (I didn’t care for the b-day cake ones.) Interesting. Katrina, Fuzz and I figured out what they taste like. 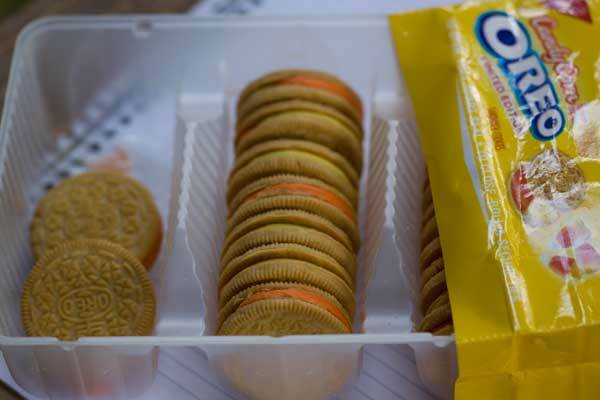 They are like the Anniversary Birthday Cake Oreos, but a different color. In other words, artificial cake batter flavor. I was thinking about them today, and put them back in favor of the football shaped oreos instead. I try not to eat processed foods, but like to give my kids a treat every now and then. Your cookie bark looks delicious!!! We were JUST talking about these cookies. I’m curious to try them! I saw these the other day but wasn’t sure if I should get them or not. I love all the holiday Oreos they come up with because they are fun to play with in recipes, but I haven’t had candy corn in years upon years so I didn’t even know what they would taste like. But now hearing that they are just okay I might not end up picking up any of them. Although, they look pretty awesome in this bark.